Despite encouraging news of a major acquisition, the telecom company hasn't given investors what they wanted this year. Telecommunications has come a long way. Image: Wikimedia Commons. The telecom industry remains cutthroat in its level of competition, and Frontier Communications (NASDAQ:FTR) has worked hard to grow into a major player on the national telecom scene. After seeing a nice rebound in its share price in 2014, Frontier shareholders came into 2015 hoping that the company would sustain forward momentum, and continue to reward its long-term investors. Yet despite news of another major acquisition from Verizon Communications (NYSE:VZ) early in the year, Frontier hasn't been able to keep its share price from falling back in the second half of 2015. Let's take a closer look at Frontier's 2015, and what the future will bring for investors. 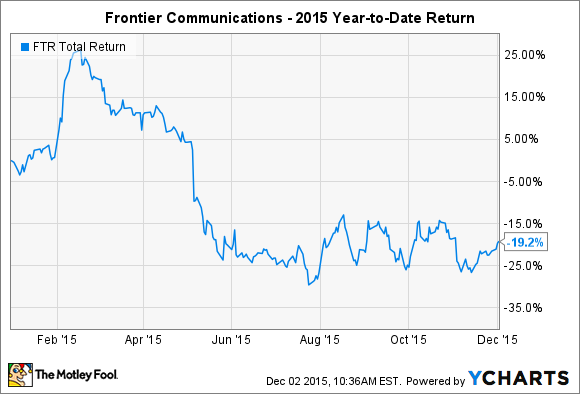 What has happened to Frontier Communications in 2015? Two things gave investors a lot of enthusiasm about Frontier early in the year. In February, the company announced quarterly results that included a big boost from its acquisition of Connecticut assets from AT&T, as broadband customers rose by 420,000. Frontier responded by raising its dividend by 5%, beginning a long path toward recovery following two dividend cuts in previous years that lopped 60% off its past payouts. February also brought the news that Frontier would purchase assets from Verizon in three key markets: California, Florida, and Texas. Verizon currently has about 3.7 million voice customers, 2.2 million broadband connections, and 1.2 million FiOS video subscriptions in those three markets. As a result, the $10.5 billion deal has much greater potential to transform Frontier into a national powerhouse than smaller acquisitions have in the past. Since then, progress on the deal has been steady, and Frontier has done a good job of getting through regulatory hurdles with the expectation that the deal will close in the near future. Unfortunately, Frontier hasn't been able to generate the growth that investors wanted to see with its current set of assets. In the second quarter, Frontier managed to add just 29,200 net broadband customers, and total residential customer and business customer counts both eased downward. Broadband subscriber growth slowed to just 27,200 net customers in the third quarter, and Frontier struggled to contain costs, as a combination of higher overhead, storm-related damage, and expenses tied to the pending Verizon asset acquisition, all put pressure on its bottom line. The good news for investors is that Frontier has managed to overcome some major obstacles toward getting the Verizon deal done. The company has had to raise huge amounts of capital, but it was able to do so through a combination of stock and bond offerings. Interest rates on the bonds that Frontier issued ranged from 8.875% to 11%, and that could create long-term pressure in maintaining that debt. Nevertheless, Frontier is optimistic about its ability to move forward, and cash in on the opportunities in Texas, California, and Florida. Looking forward, Frontier will have to convert on the growth opportunity that the latest Verizon deal will bring, retaining existing customers, and tapping into new markets. Frontier also is looking to compete against Verizon and other carriers by appealing more to small-business customers, with an offer that includes fixed pricing for the life of a customer's service. At the same time, though, Frontier will struggle with the same problems that plague other telecoms. In particular, cord-cutting has many people dropping landlines and TV services in favor of mobile phones and streaming video. Frontier's answer is to push broadband as hard as it can. If it succeeds, then Frontier stock could bounce back in 2016 -- especially if a finalized Verizon transaction brings high growth along with it.